It’s now officially winter time, and that means it’s a great time for triathletes to work on their swimming. As you are most likely stuck inside and don’t want to run or ride for hours indoors, use the extra time to focus on bringing up your swim fitness. I’m not talking about hopping the pool a couple times a week to do some technique sessions, but to really dig into a solid swim training block. Using paddles will not only help develop strength and muscular endurance, they can also highlight hitches in your stroke. They can allow you to “feel” the water more and give you something more visible if you check your stroke. For example, are you lifting up as you extend after entry, essentially putting on the brakes? You’ll probably feel and see that more with paddles. If you are a newer swimmer, new to paddles, or know you have some technique flaws, just use paddles that are about the size of your hand. Make sure you are engaging the lats in your pull so that you are not putting unnecessary strain on your shoulders. Incorporate paddles once or twice a week, and gradually increase the volume. If something doesn’t feel right, stop, and perhaps go back to a few drills for technique. 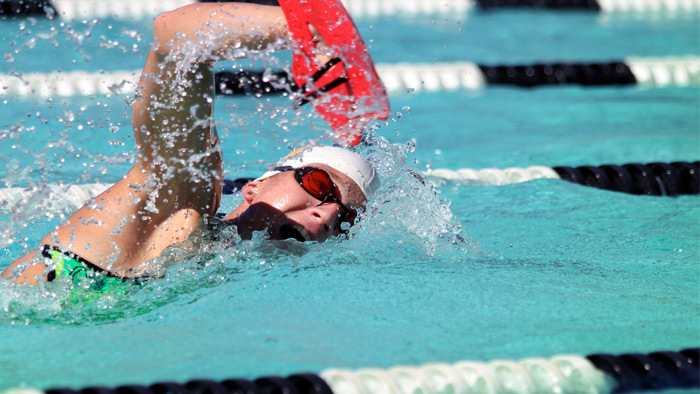 Many triathletes say they like to swim with a pull buoy because it is similar to swimming in a wetsuit, and some people might find it “easier” to swim with one as it takes the legs out of the equation. Isolating the core and upper body is a good thing, and doing sets with the pull buoy can help you focus on engaging your core and help ensure you are pulling yourself straight through the water. You still want body rotation, but it needs to be controlled with a tight core. If you find you wiggle and wobble with a buoy, work on keeping the core tight, and check the path of your pull. Crossing over (either on entry or pull), too much rotation, or too wide of a pull are likely to create a non-ideal path through the water. If you can’t make it to the pool as often as you’d like, or just want some solid dry land work to complement the swimming, add in technique work out of the pool. This is especially great for those of us who didn’t learn good swim technique as a kid. Swimming requires muscle memory of the correct patterns and we have a better feel for what our bodies are doing out of the water. Training your muscles the high elbow catch and good pull on dryland with stretch cords so you can better see and feel what’s going on is a fantastic way to improve your stroke. The resistance of stretch cords is an additional strength session. Incorporate at least a few drills each session as a part of your warm-up to keep your focus on good form. Technique sessions are also good “recovery” sessions after a hard day. Now is a great time to focus on your swim and build up what is a weakness for many triathletes. Additionally, by putting the time in the pool now, you can switch to a bike or run focus when the weather turns better.